Let's go back for a few minutes to the NYFW mirage... Not just because it was Fashion Week, but because the hot weather as well... I wore more than one outfit per day :) ok. let's be honest: because I love fashion too!!! I wore this look on a Monday morning going to see Saunder Presentation and right after that I had a great shopping session with my ladies Nadia and Ange. I miss these ladies and NYFW days already! I love the mix of prints in b&w and that you kept it you with the fun colorful bag..perfect! 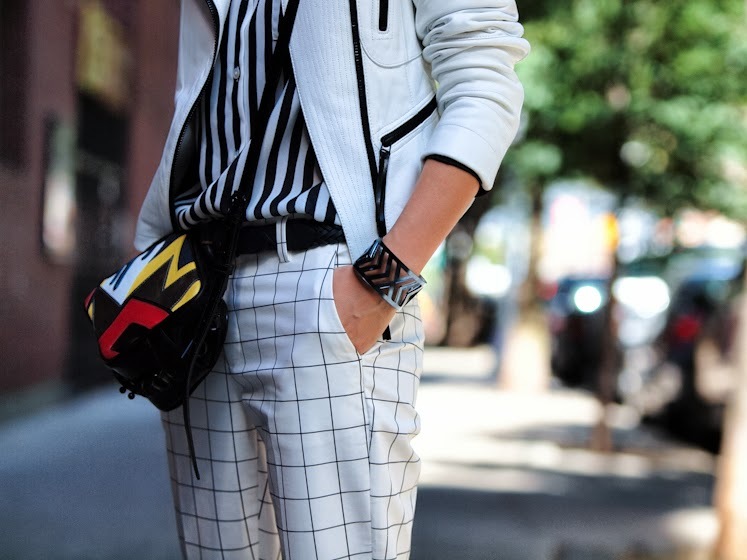 Fabulous shots – Love the chic black & white prints! Yes, yes yes! Those trousers are to die for! Love it! Love this look! the stripes on pants and blouse work so well together, who would have thought?! I love those pants! They are so cool! the contrasting lines work so well together! Very original combination! I love how you mixed these prints. Fun look! Loving your jacket and shoes! This is very unique way to combine black & white!